40 Piece Custom Mini Pastry Sampler in a Wooden Crate for sale. Buy online at Zingerman's Mail Order. Gourmet Gifts. Food Gifts. Use the menus below to choose the pastries you'd like. 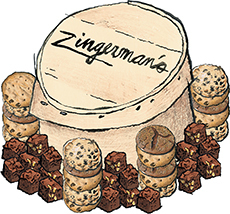 Your selection is hand packed to order in our classy wooden crate with Zingerman's emblazoned across the top.